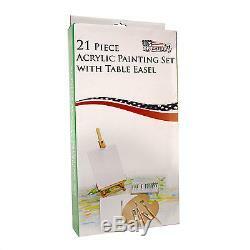 Art Supply 21 Piece Acrylic Painting Set with Table Easel. 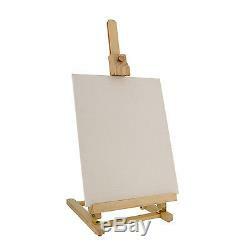 Easel Size: 7-7/8" Wide X 9-1/2" Deep X 21-1/4 High. Adjusts Up To 26 High. 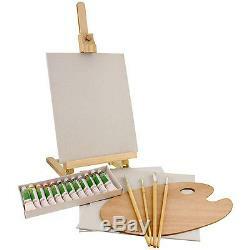 Holds Canvas Up To 15-3/4. 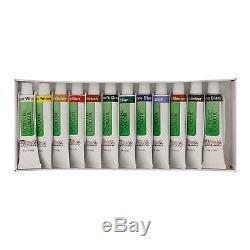 12 Piece 12ml Acrylic Colors. 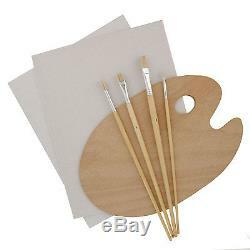 4pcs Artist Brushes Size 2,4,6 & 8. Wooden Palette 20 X 30cm. This listing is currently undergoing maintenance, we apologise for any inconvenience caused.